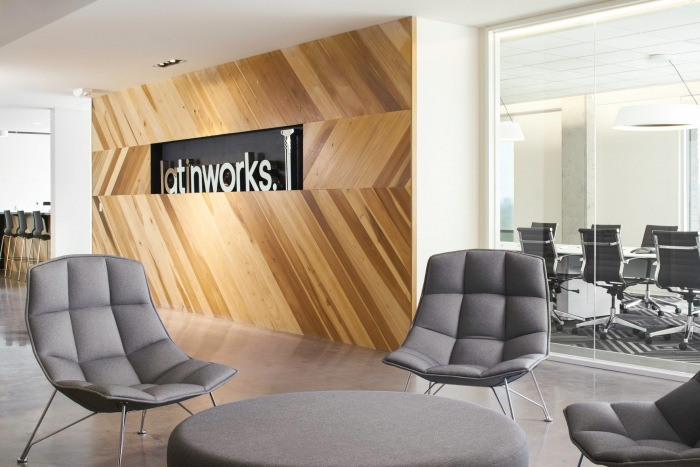 Studio8 Architects designed the offices for cultural branding agency LatinWorks, located in Austin, Texas. LatinWorks, a full-service, multicultural advertising agency required a design that supported a buzzing, high-energy environment for its employees and at the same time, function as a show piece for it’s daily, client interactions. The budget was tight and the new space included an ever growing number of leasable suites, causing the designers to modify the original program into a shrinking amount of square feet throughout the duration of the project. The organizational layout provoked collaboration and forced interaction between employees, something their previous space was lacking in. The designers dispersed different functions throughout the floors to force movement between the two levels through a connecting and collaborative stair. Designers compromised on other budgetary items to ensure LatinWorks kept the connecting stair as it was key to the high energy environment. Situating the reception near the connecting stair allowed for guests to be immediately surrounded by the creativity and collaboration of the agency. In addition to creating a dynamic impression for clients, the reception and screening room capitalized on the building’s views of downtown Austin.